Origin and Habitat: Echinocereus huitcholensis is known only from the type locality. Type locality: Sierra de Nayarit (Part of Sierra de los Huitcholes), Jalisco, Mexico. Echinocereus polyacanthus Engelm. in Wisliz. Echinocereus leanus var. multicostatus (Cels) K.Schum. Echinocereus santaritensis W.Blum & Rutow in W.Blum et al. Echinocereus acifer subs. tubiflorus W.Rischer in W.Blum et al. Echinocereus marksianus Fritz Schwarz in Backeb. Echinocereus polyacanthus subs. pacificus (Engelm. ex Orcutt) Breckw. Echinocereus pacificus subs. mombergerianus (G.Frank) W.Blum, W.Rischer & Rutow in W.Blum et al. Echinocereus polyacanthus subs. mombergerianus (G.Frank) Breckw. 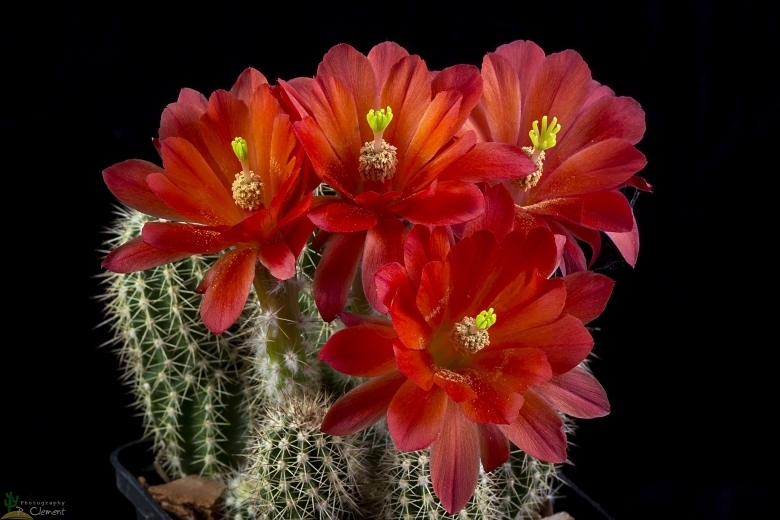 Description: Echinocereus polyacanthus subs. huitcholensis (Echinocereus huitcholensis) is a clumping cactus, forming cushions, with brilliant orange up to 11 cm long flower. Derivation of specific name: "huitcholensis" for the occurrence in the Sierra de los Huitcholes, Jalisco, Mexico. Stems: 4 to 6 cm long, 2 to 4 cm in diameter. Radial spines: 10 to 12.
orange, spines on ovary and tube weak, acicular. Areoles of flower-tube bearing long cobwebby hairs. Echinocereus plomosus hort. : It is a highly branching plant that forms large clumps and blooms abundantly, just as a small specimen. Echinocereus polyacanthus Engelm. in Wisliz. : Very variable species with beautiful deep red flowers, with many petals that form the shape of a cup and a wooly tube. 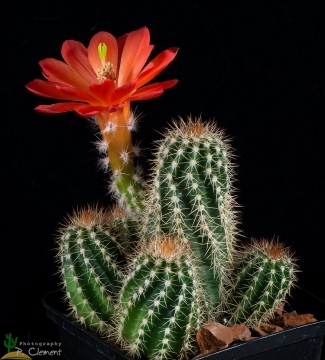 Cultivation and Propagation: This cactus is widely cultivated for its flowers. It is among the easiest species to grow, flower and propagate. Water regularly from March to October. Rot prone in winter, it needs good drainage. Claret Cups require strong sunlight to maintain a healthy appearance, and a harsh "dry and cool" winter environment combined with maximum light exposure enhances spring flower production.